This is the first Smart TALK in a series of asking Jarrod 3 questions. This talk focuses on Jarrod's WFM past, present, future. Pamposh: Good day, listeners. 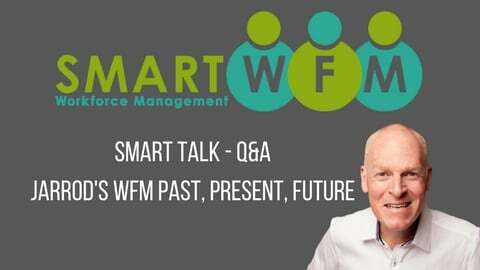 This is Pamposh from Smart WFM, and welcome to Smart WFM’s Smart Talk series. This series is going to be based on three questions that we’re going to ask Jarrod McGrath, CEO and founder of Smart WFM. Every discussion will be 10 to 15 minutes’ long, and we will be asking those questions of Jarrod, one-on-one. Jarrod has been in the WFM space for almost two decades. He has just published his book, Digital Workforce, and we are glad to have him with us today. Jarrod: I’m really well, Pamposh, thanks for the introduction. Really excited to be talking about WFM today. Pamposh: So Jarrod, the first question today for you is, how did you get into WFM? Jarrod: Yeah, great question. Many years ago, I went to university like a lot of people do, and I studied an area of mathematics known as Operations Research, and the specific area of Operations Research is really about, how do we take assets – whatever those assets may be; they could be physical assets, machinery, they could be people – and it basically looks at mathematical ways to optimise the use of that asset. It could be to ensure that the uptime of a piece of machinery is the greatest. From a person perspective, it could be to optimise the cost of that person. But then you can put other constraints in as well, like to maximise sales and these sorts of areas of mathematically solving these problems, that we ultimately, are challenged by businesses to do. As well as that, I studied computer science and I studied all the theory up to and including artificial intelligence. Now, 25 years ago when I was at university this all seemed very theoretical, but roll forwards 25 years and here we are, seeing all of this emergence of mathematics, statistical analysis, artificial intelligence, and I’m just really blessed to have studied all this theory many years ago when I was at university, and I’m also able to see the practical use of that now from a workforce management perspective. So, over the years I’ve been involved in working with the leading suppliers of workforce management technology, which has been amazing to watch the space evolve and to look at how it’s moved from a system of record many years ago, to now a system of productivity, and I’ve also been very lucky to be involved in many large scale programs of work looking to optimise workforces. So, I’ve been around the space for a long time and have had a really solid grounding in the space. So that’s ultimately how I got into WFM. Pamposh: Well thanks for that, Jarrod, quite interesting indeed. And the second question for today is, at present what are you doing in this space? Jarrod: What a great question. So, over the last 12 months in particular, I’ve taken the time to take my 15 or 20 years of knowledge and write a book called The Digital Workforce. I’ve been involved with clients for many, many years, and what I found when I went to those clients over and over again was that the same questions would get asked each time: What do we need to do from a business perspective to engage to change our workforce; to get benefits from workforce management; what is workforce management; what benefits can we get from it; how do I know the program that I’m going to undertake is going to give me the benefits; and how can it be successful? So, over the last 12 months I’ve written a book that’s very much through the eyes of a customer, and it addresses many of these things that customers have been asking me all those years. So, the book is divided into two halves. The first half is, what is workforce management? It defines what workforce management is, and it does that by looking at some very practical examples. We do some interviews with senior people in business, from a vendor perspective, from a customer perspective and from a digital artificial intelligence perspective, specifically around people, and we unpack what workforce management means through those difference perspectives, from a customer’s point of view. Then the second half of the book is really all about, here’s a methodology that I’ve seen work, time and again, through the eyes of a customer, to live out these programs of work. And I guess that the real essence of it, though, from a customer’s point of view, is that the methodology starts by asking: What is your organisational goal; how can I take that organisational goal; and how can I deliver those organisational goals for the workforce? And to get the maximum value for the workforce, as I do it. Then, it goes right through the process of achieving those goals right down to the point that once you’ve actually achieved them, it then looks at measures of those goals. So, have we actually achieved what we set out to achieve, and can we go back to the senior leadership team within the organisation and demonstrate that we’ve delivered those goals? So, that’s really what I’ve been doing up until the present time and we’ve got some great client examples of where we’ve done this. It’s very exciting to be able to take the book to the public very shortly. And to be able to give back to the community a lot of what I’ve learned over the last 15 to 20 years. Pamposh: Thanks Jarrod. And the final question for today is, looking towards the future, how do you see yourself attached or involved with the changes? And some changes, which you can also bring to our knowledge as well? Jarrod: I think that a lot of what we’ve been hearing in the market in terms of artificial intelligence, in terms of data – and I could go on with all the buzz words – but I think for me, it’s actually using all of these technologies that are around us to solve business problems. And it might sound really simplistic in the way that I put it, but at the end of the day we’re all looking to solve business problems. And I think where I really want to be attached, and where I think I can add the greatest value at this point in time is to actually work with the market, work with the industry, work with our customers to provide tools like the book, or like methodologies that we’re going to bring to the market, to be able to take a business strategy and turn it into a whole of business strategy, so that all the departments in an organisation are actually working towards a common good, for the greater goal, and to be able to deliver that in the most efficient and effective way that we can. So the way I see that I will be able to provide the greatest value based on the knowledge that I’ve been lucky enough to learn over the years, is to actually give back that knowledge and to work across the businesses to get that greater engagement so that we can ultimately deliver outcomes. So, working very closely with Operations, working very closely with HR, working very closely with Payroll. And ultimately, that’s where I see the greatest value that I can give back. In terms of where do I see the industry going, I think that we’re also going to become very much consumable in the way that we deliver these outcomes as well, so I think that where we work in an environment at the moment that is predominantly time and materials based, or I’ll give you this and you pay me that, I think it’s going to become much more outcome based in the future, and it’s all coming back to those whole of business goals as well. So, I think that we’ll see a change in the way in which we actually achieve those benefits into the future. 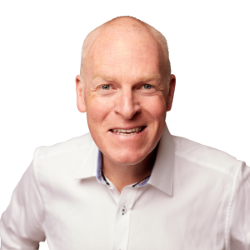 And at the broadest level that’s really where I see myself playing into the future, and I’m very excited about what the future holds for organisations and for workforces within those organisations. Pamposh: Thanks, Jarrod, for allowing us to know the answers to those three questions we asked you today, and thanks to our listeners. And if you have any questions , please send them to us in the comments section below, or you can email us at our website. Thank you. Jarrod: Absolutely, thanks for taking the time to listen and I’ll look forward to having a few of these impromptu discussions. Ask me three questions, and I’m always happy to talk, anyone who knows me knows that. And, please send in questions because I’d love to answer them for you. Thanks, everyone.